Reduce Biological Contaminants & Stop Odors. Reduce the odors of tobacco smoke, mildew, mustiness, chemical vapors, and toilets, and inhale fresher, cleaner, healthier air virtually anywhere you go. Effective in areas up to 500 sq. ft. (46 sq. m), the Breathe Easy™ Portable Air Purifier uses innovative Photocatalytic Nano-Mesh technology with ultraviolet (UV) light to improve air quality. The UV bulb inside uses a specific frequency of light that produces no harmful ozone. The unit operates quietly and has two fan-speed settings. A worldwide AC adapter with plugs is included, as well as a 12V DC power plug. 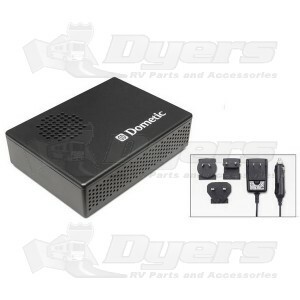 The Dometic Breathe Easy is an air purifier that uses photocatalytic nano-mesh technology and ultraviolet light to improve the air quality by constantly circulating the air through the device. Please note that the device does not fix the source of ongoing odor problems. For example, a leak that caused mold must be repaired and the mold must be removed. NOTE: Ultraviolet lamps have a limited service life. After around 9000 service hours (about a year of continuous use) they lose their germicidal effectiveness. You must therefore replace the lamp after this period and or anually, even if it still lights up. USE NOTE: Each time you switch the ultraviolet lamp on and off, you reduce its service life by about an hour. Eliminates unpleasant odors, enhances air quality. Up to 98% reduction in volatile organic compounds (VOCs). Up to 99.9% reduction in bacteria, fungi, mold, and pollen grains.